Middlesbrough won at Nottingham Forest for the first time since 1999 to firm up second place in the Championship. David Nugent gave Boro the lead inside the first two minutes after poor defending from Forest, before Matt Mills volleyed home from a corner to make it 1-1 after just seven minutes. Daniel Ayala headed the visitors back in front before the break. 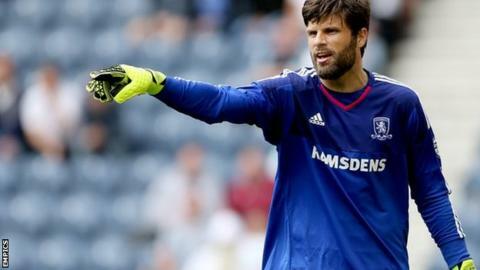 Henri Lansbury had the chance to save a point for the hosts but goalkeeper Dimi Konstantopoulos kept out his penalty. Both teams went into the game in good form, with Forest having won their last two and Boro victorious in their last four matches in all competitions. It was the visitors who made the perfect start when summer signing Nugent flicked home after George Friend had sent in a low cross that Forest failed to deal with. Mills, who was forced off with a hamstring injury later in the first half, made sure the lead was short-lived thanks to a lovely cushioned volley from a Lansbury corner. Nugent and Albert Adomah both forced good reaction stops from Dorus de Vries as Boro looked to get back in front, before Ayala bravely headed the ball home from close range after a short corner caused havoc in the home defence. Forest started brightly after the break and Ryan Mendes and Chris O'Grady brought fine saves from Konstantopoulos in the Boro goal. The Greek goalkeeper then secured all three points for his side when he denied Lansbury from the spot with 12 minutes to go after Ben Gibson had handled in the area. Nottingham Forest manager Dougie Freedman: "We were playing against the side I believe will be the champions of the division come the end of the season. "I understand what Forest fans want, I cannot always deliver it, but we did play some attractive football today and we created numerous opportunities. "You are not going to see me with my chin on my chest. Is there progress here? Yes there is." Middlesbrough head coach Aitor Karanka: "We have made a mistake for the goal and the game was difficult, but we got the second goal and we got the result. "We lost here last season in a similar type of game, but we have won this time because we have the quality, because we have experience; we have experienced players on the pitch. "In the end, that helped us to collect the three points." Match ends, Nottingham Forest 1, Middlesbrough 2. Second Half ends, Nottingham Forest 1, Middlesbrough 2. Attempt saved. Chris O'Grady (Nottingham Forest) header from the centre of the box is saved in the top centre of the goal. Assisted by Eric Lichaj. Daniel Pinillos (Nottingham Forest) wins a free kick on the left wing. Foul by Diego Fabbrini (Middlesbrough). Jonathan Williams (Nottingham Forest) wins a free kick in the defensive half. Offside, Nottingham Forest. Chris O'Grady tries a through ball, but Ryan Mendes is caught offside. Attempt missed. Jamie Ward (Nottingham Forest) right footed shot from outside the box is high and wide to the right. Assisted by Henri Lansbury. Corner, Nottingham Forest. Conceded by Grant Leadbitter. Adam Clayton (Middlesbrough) wins a free kick on the right wing. Attempt missed. Henri Lansbury (Nottingham Forest) right footed shot from outside the box misses to the left. Assisted by Jonathan Williams. Substitution, Middlesbrough. Adam Forshaw replaces Christian Stuani because of an injury. Delay in match Christian Stuani (Middlesbrough) because of an injury. Ryan Mendes (Nottingham Forest) wins a free kick in the attacking half. Attempt saved. Christian Stuani (Middlesbrough) right footed shot from outside the box is saved in the bottom left corner. Assisted by Diego Fabbrini. Diego Fabbrini (Middlesbrough) is shown the yellow card for a bad foul. Corner, Nottingham Forest. Conceded by Adam Clayton. Ryan Mendes (Nottingham Forest) wins a free kick in the defensive half. David Vaughan (Nottingham Forest) is shown the yellow card for a bad foul. Corner, Nottingham Forest. Conceded by Dimitrios Konstantopoulos. Attempt saved. Jamie Ward (Nottingham Forest) header from the centre of the box is saved in the bottom right corner. Penalty saved! Henri Lansbury (Nottingham Forest) fails to capitalise on this great opportunity, right footed shot saved in the centre of the goal. Penalty conceded by Ben Gibson (Middlesbrough) with a hand ball in the penalty area. Substitution, Nottingham Forest. Jonathan Williams replaces Nélson Oliveira. Christian Stuani (Middlesbrough) wins a free kick in the defensive half. Foul by Nélson Oliveira (Nottingham Forest). Attempt blocked. Jamie Ward (Nottingham Forest) left footed shot from outside the box is blocked. Assisted by Henri Lansbury.